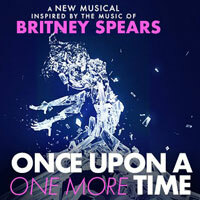 James L. Nederlander and Broadway In Chicago announced ONCE UPON A ONE MORE TIME, a new Broadway-bound musical comedy set to the smash hit music of Grammy Award-winning superstar Britney Spears, will have its world premiere this fall at Broadway In Chicago's James M. Nederlander Theatre (24 W. Randolph Street). Previews begin Tuesday, October 29, 2019, with an opening night of November 13, 2019, for its limited engagement through December 1, 2019, before heading to Broadway. The musical features an original book by Jon Hartmere (The Upside, bare), with direction by Tony Award nominee Kristin Hanggi (Rock of Ages) and Choreography by MTV Video Music Award nominees Keone & Mari Madrid (Justin Bieber's "Love Yourself"; "World of Dance"). "Throughout her career, Britney has captivated fans across the globe with her singular brand of energy and resilience," said James L. Nederlander. "For three years, we have been working closely with her to develop a concept that perfectly encapsulates her unique spirit, and are so thrilled to finally bring this joyous and electrifying show to the stage." "I'm so excited to have a musical with my songs - especially one that takes place in such a magical world filled with characters that I grew up on, who I love and adore," said Spears. "This is a dream come true for me!"